ANYONE´s recipe may sound simple, but it´s most difficult to master nonetheless: take a bit of of singer/songwriting, add some jazz and let a pinch of spicy pop be the finishing touch. If it´s done with perfection as by vocalist Eva Mayerhofer, guitar player Hanno Giulini and Boris Friedel on bass and baritone guitar, you end up with a rich variety of unique and colourful songs. Each one a little journey in itself the listener is gently taken by the hand and introduced to an intimate modern chamber music that is very pleasant to listen to but with an enormously strong musical backbone. At the very center of ANYONE there are of course Mayerhofer´s charismatic vocals, Giulini´s delicate guitar playing and Friedel´s groovy and solid Bass and baritone guitar work, weaving a tight and yet transparent musical fabric that is both genuine and convincing. ANYONE´s intimate arrangements reveal a philosophy that seems rare in today´s pop-music and yet often holds a No.1 position on our inner list of values once we take the time to really think about what matters: less is more. At the same time great care is taken down to the smallest detail in arrangement, sound and vocal / instrumental interpretation. Unusual harmonic movements are smoothly veiled by clear-cut patterns unfolding simple and strong song-structures which help to communicate sophisticated lyrics behind intriguing melodic lines. Underneath all a strong rhythmical groove makes it easy for EVERYBODY to follow ANYONE´s music. 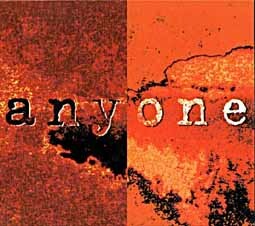 Song by Eva Mayerhofer and the groups´s cover version of Bonnie Raitt´s "Cry on my shoulder. Instrumentation and sound varies from fragile duo-arrangements to richer pieces recorded with an additional rhythm section. 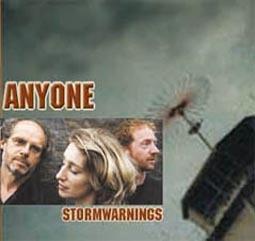 ANYONE´s new CD release is called STORMWARNINGS and encompasses very much the live work of the former vocal/guitar duo since new bass/ baritone guitar player Boris Friedel joined the group. Together with drummer Matthias Philipzen and percussion player Angela Frontera from Brasil he takes care of the low end of ANYONE´s sound, providing solid laid back grooves. A wide spectrum of acoustic and electric guitar sounds create an appropriate atmosphere for Eva Mayerhofer´s rendering of a selection of new songs circling around the overall apprehensive mood of STORMWARNINGS. "A Dizer  written by Boris Friedel and brazilian singer Rosanna Tavares  adds a special counterpoint in style and poetic imagery extending the expressive range of ANYONE´s musical vocabulary. Visit our web-page "CDs for audio impressions of selected songs from both CDs. Orders (16,00 Euro per CD including shipping in Europe) can be placed under: hgiulinin@yahoo.de. Please also refer to this e-mail address for contact /questions and suggestions of any kind or call: +49 0173 6624850.